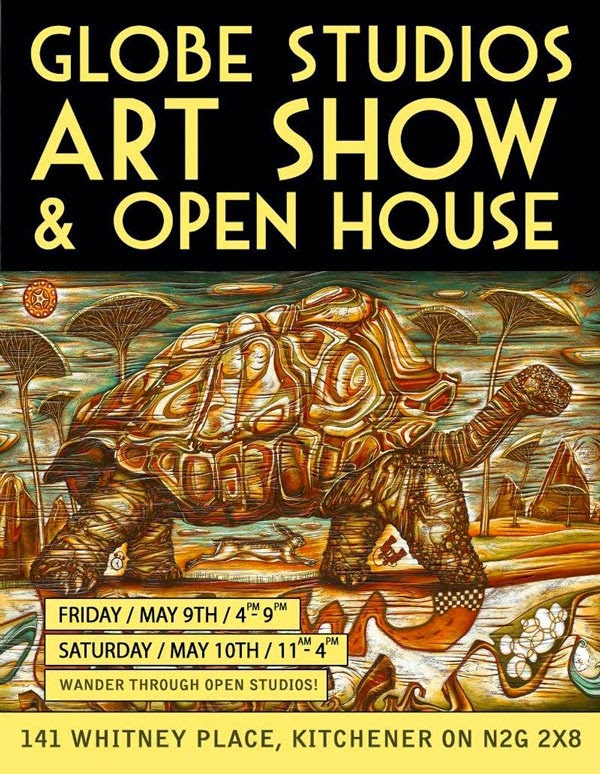 Once again it's time for the Globe Studios open house and once again I'll be among the juried guest artists exhibiting in the halls. It promises to be a great show and a perfect opportunity to reduce your Christmas shopping list. 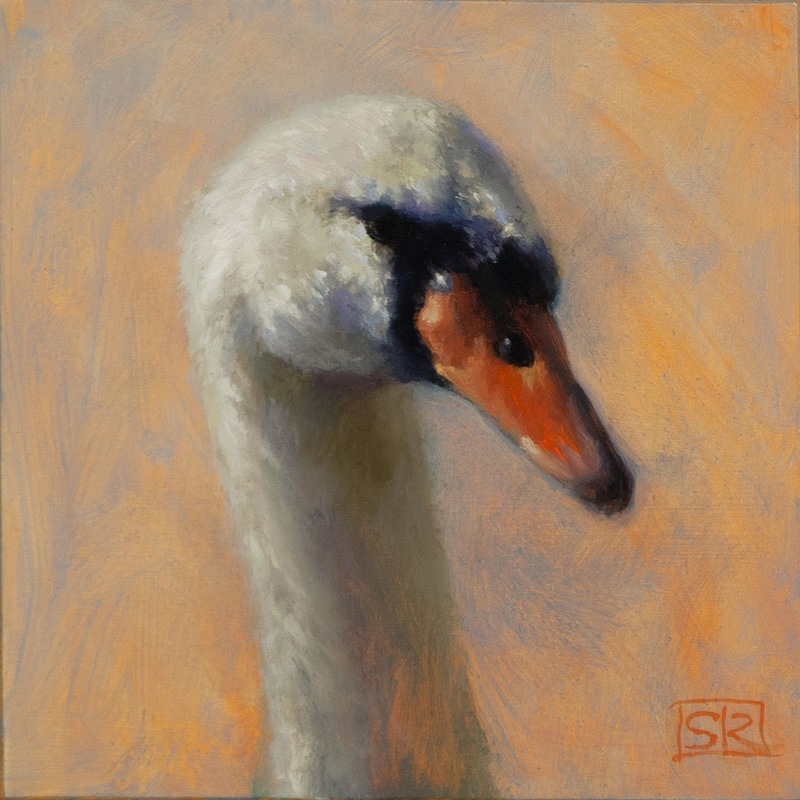 Head of a Mute Swan, oil on panel, 6" x 6"
Globe Studios is located at 141 Whitney Place, Kitchener in the former Bonnie Stuart Shoe Factory. 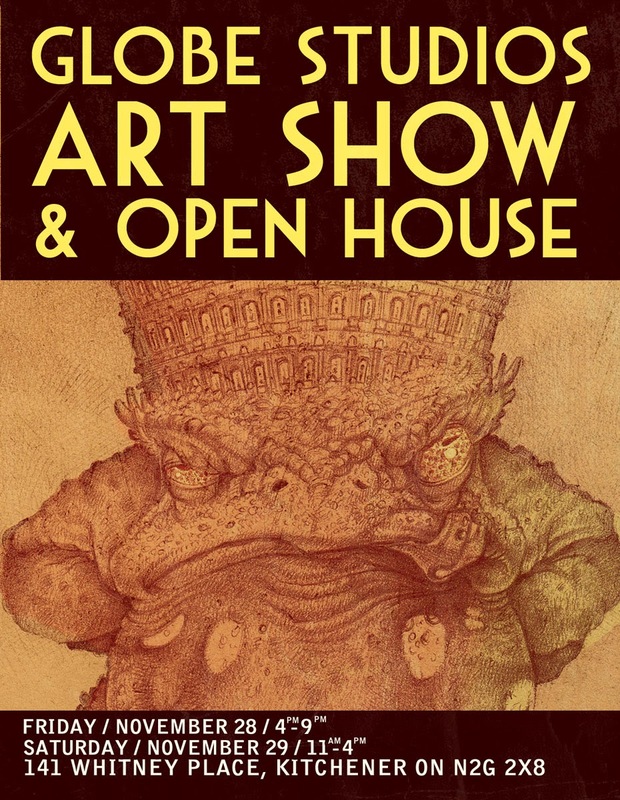 The show runs Friday, November 28th from 4-9pm, and Saturday, November 29th from 11-4. I hope to see you there. 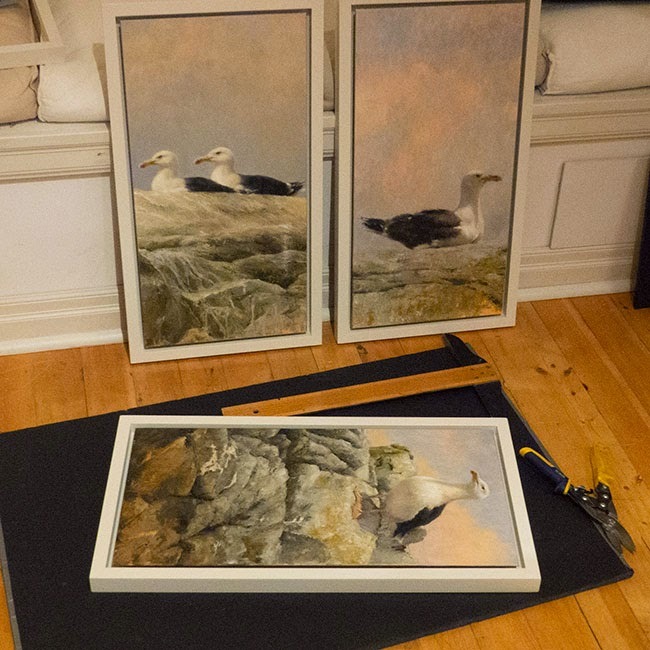 Some of my recent gull paintings are going to be at the juried show at Gallery 1313 in Toronto in support of FLAP Canada whose bold mission is safeguarding migratory birds through our urban environment. 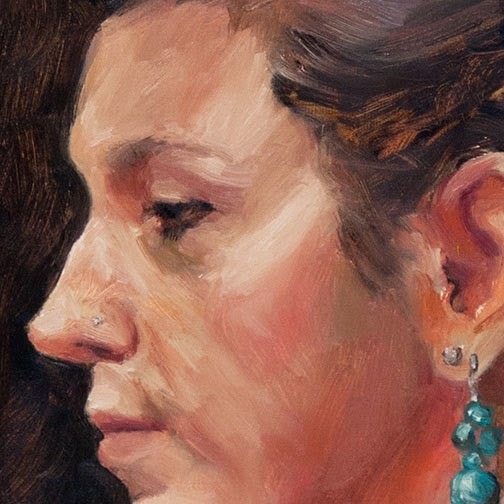 The opening reception for the exhibition titled Flights of Fancy is Thursday, November 13, from 6:00 pm, with general admission starting at 8:00. 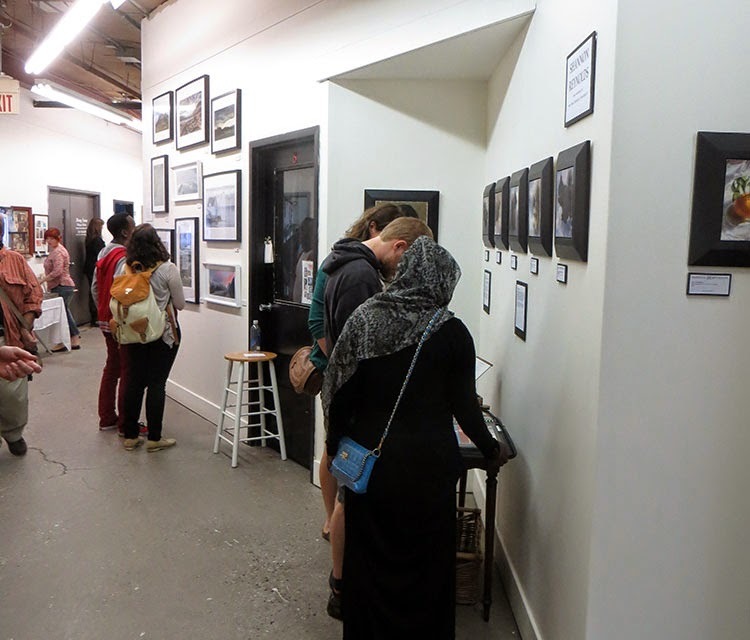 Gallery 1313 is located at 1313 Queen Street West, Toronto, ON. If you'd like your name on the guest list for the preview, please let me know to avoid disappointment. I can't quite believe you're gone, so soon. I'm not willing to let you go, though. 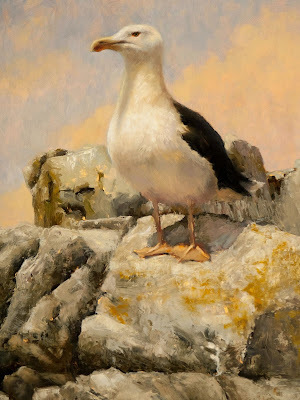 I have a few more beaches and gulls up my sleeve, to try to call you back. 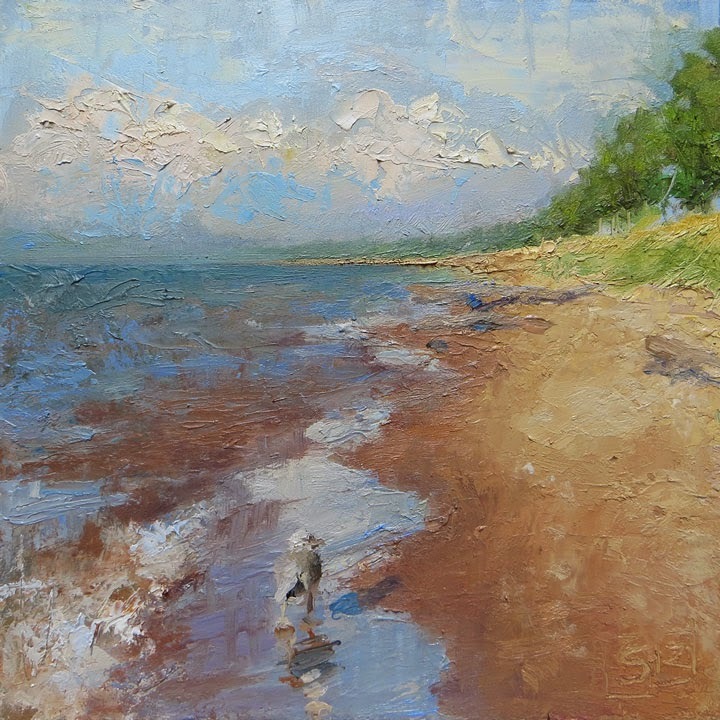 Beach and gull, late afternoon, oil on panel, 6" x 6"
This one is from the wonderful beach and dunes at the Pinery Provincial park, but could be anywhere, really. 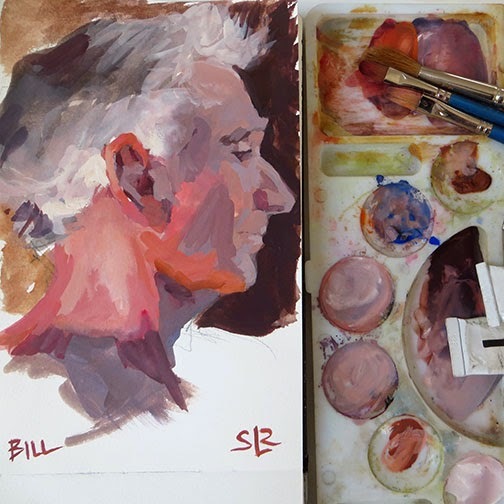 A quick portrait sketch of model, Bill, in my Moleskine watercolour sketchbook from last night's life drawing session with Fabio at the Cambridge Centre for the Arts. 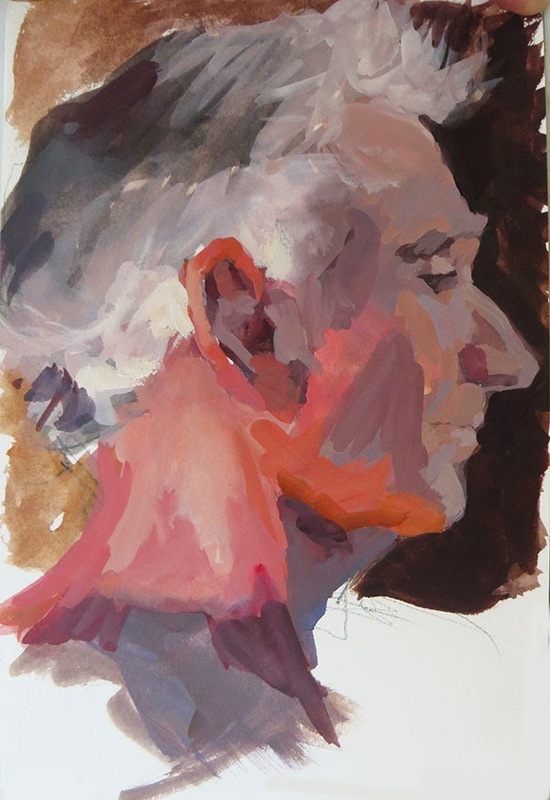 Bill, profile, gouache in watercolour sketchbook 5" x 8"
Here's a small portrait sketch in oils from last night's life drawing session. The model is our session coordinator and sometime model, Miss Robin. 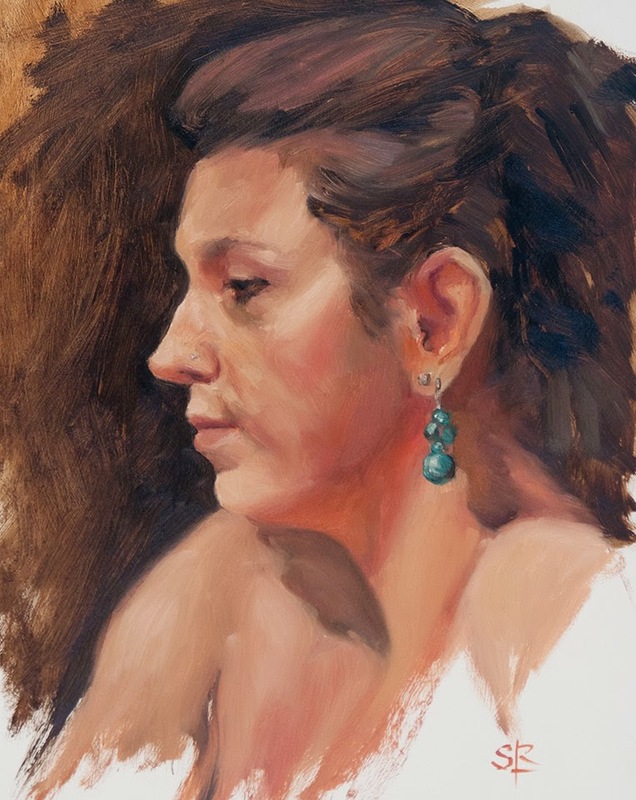 I've been using far more paint of late--applying it thickly, with almost no added medium except what I need to make the paint workable, and drawing directly with the brush instead of relying on a preliminary underdrawing. It's exhilarating. The light in the room where we draw is lit with low pressure sodium lights, which are great for energy efficiency, but terrible for colour rendering accuracy. Under those lights, I lose all perception of the red spectrum, which isn't a problem when I'm drawing, but is a definite challenge when painting. 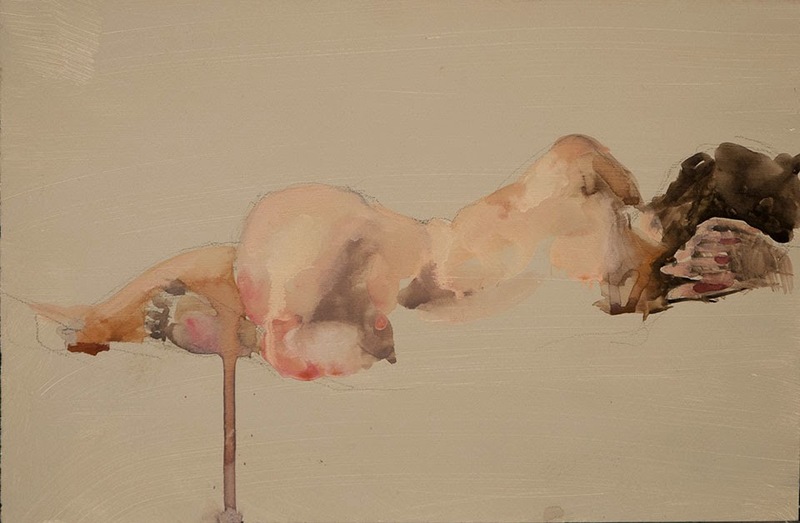 I always emerge from the room with a far more highly saturated painting than what I'd perceived. Last night I paid closer attention to my colour mixes and tried to get the tones right, so the painting isn't quite as far off as usual. Still, it's a little like painting while colour blind. 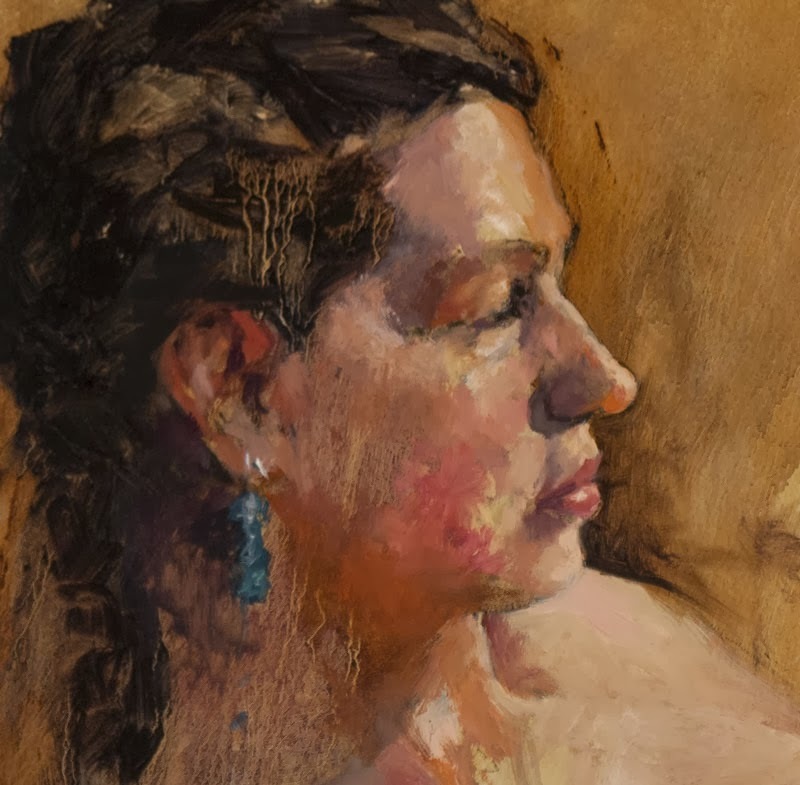 I love the Cambridge life sessions, so maybe I'll look into getting some kind of clip-on light with high colour rendering index to take with me on painting nights. 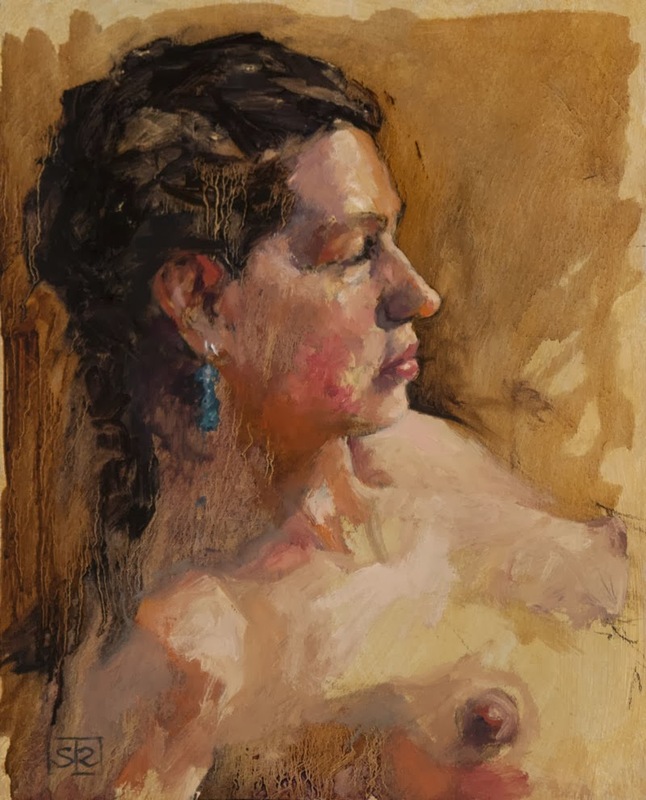 A portrait sketch of Miss Robin, oil on panel, 11" x 14"
This landscape painting is not mine, which is to say I painted it, but it’s a copy. 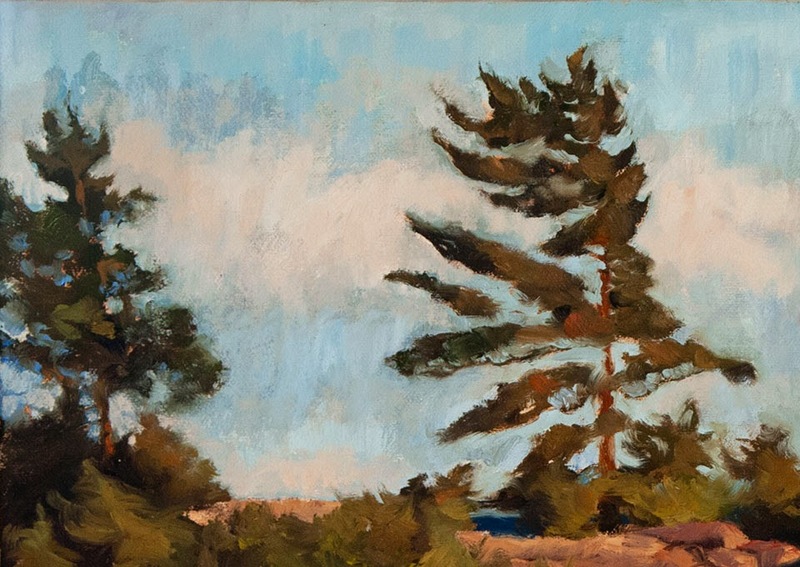 How easily a wind twisted pine against pink tinged clouds against a blue sky evokes the northern Ontario (okay, northern, southern Ontario) landscape. Made me want to trade my brushes for a paddle. 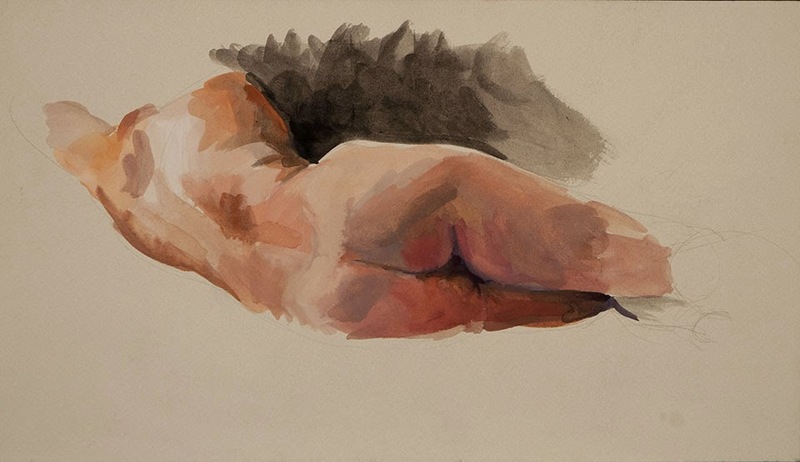 Reclining figure study 1, gouache on paper, 11" x 7"
Reclining figure study 2, gouache on paper, 11" x 7"
Apologies to the people next door who were recording something and had probably expected the studios to be unoccupied on the Saturday of a long weekend. 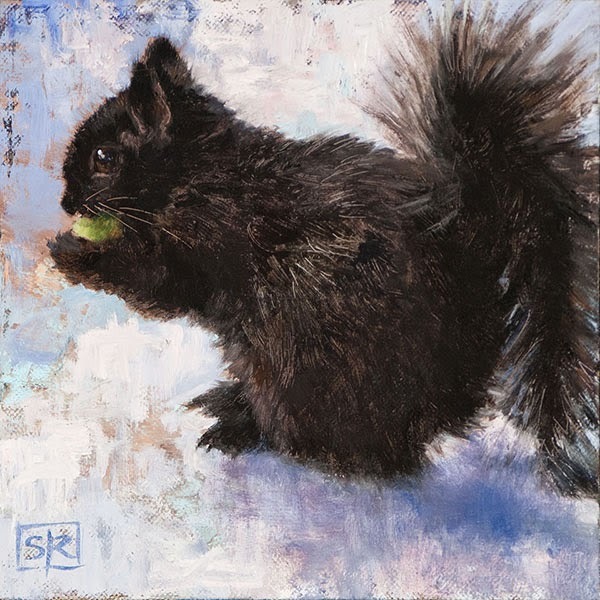 Local Character Study #5 Black Squirrel with Granny Smith Apple, oil on canvas board, 8" x 8"
My winter-long love affair with the backyard squirrels is officially over. As in Leslie Feist's lyric from Gatekeeper, this is the half of the year when we'll never be friends. It's the half of the year when the cute fluffy animals struggling to survive the bitter winter and posing as ready models around my bird feeder transform themselves into wanton destroyers of beauty. No tulip or magnolia or crabapple blossom is safe from the ruthless biters. 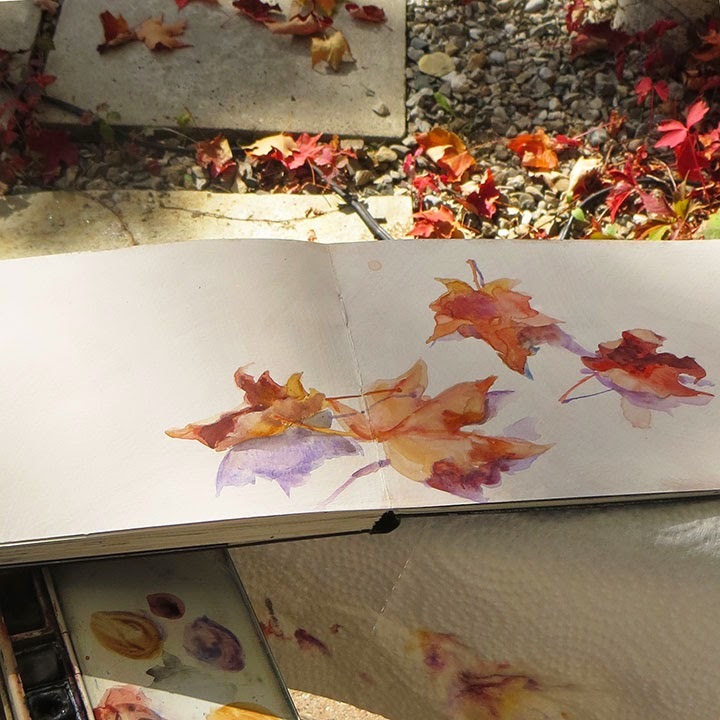 It's the season of anticipation when, when instead of flowers, alas, there are only bare stems and strewn petals. Ugh. 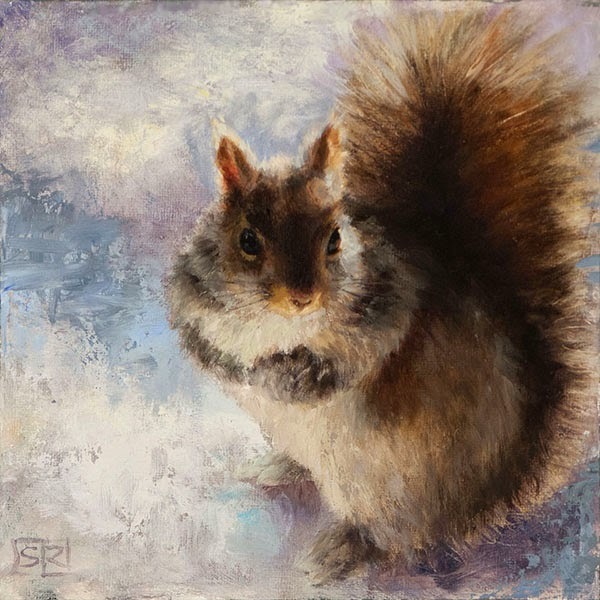 Local Character Study #4 Eastern Grey Squirrel Looking Out, oil on canvas board, 8" x 8"
The two admittedly cute squirrels in this post were painted with snow still on the ground. 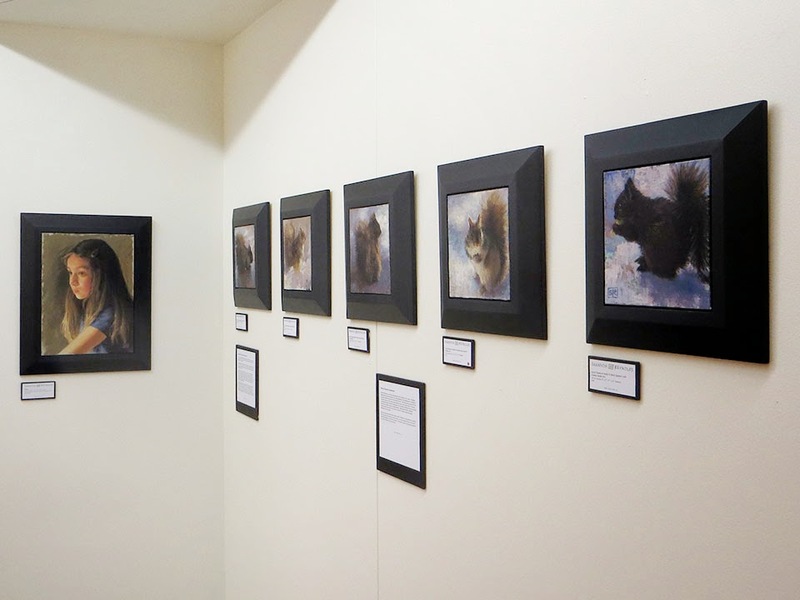 Future squirrel portraits, at least those painted in the next six months, will be far less flattering. If I wanted to be truly realistic, they might even have mange. 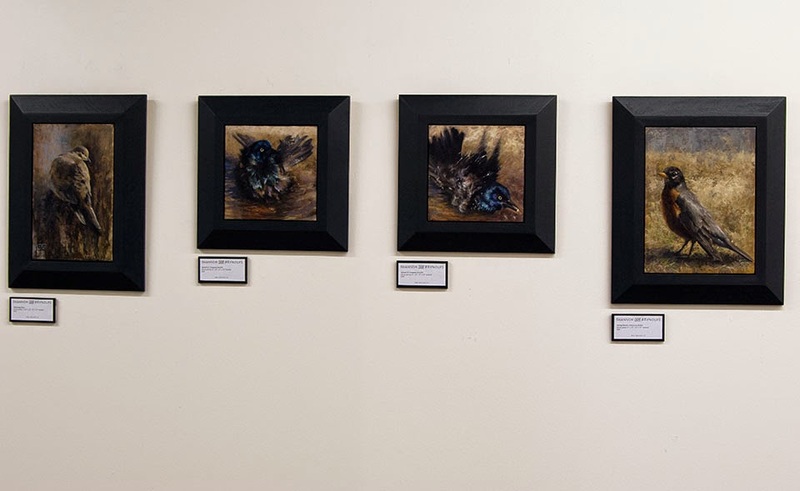 I spent part of this beautiful day hanging my paintings at Globe Studios in Kitchener. 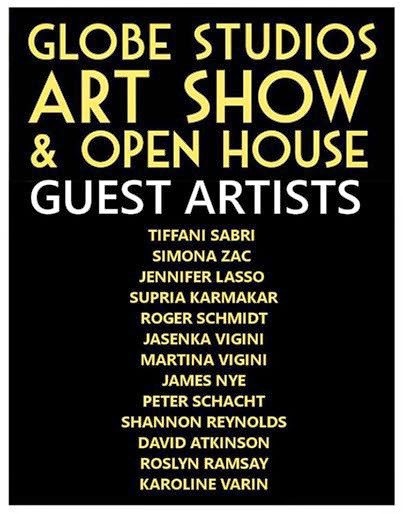 Twice yearly Globe studios opens its doors to the public for a tour of the studios and an exhibition of works by resident and local artists. 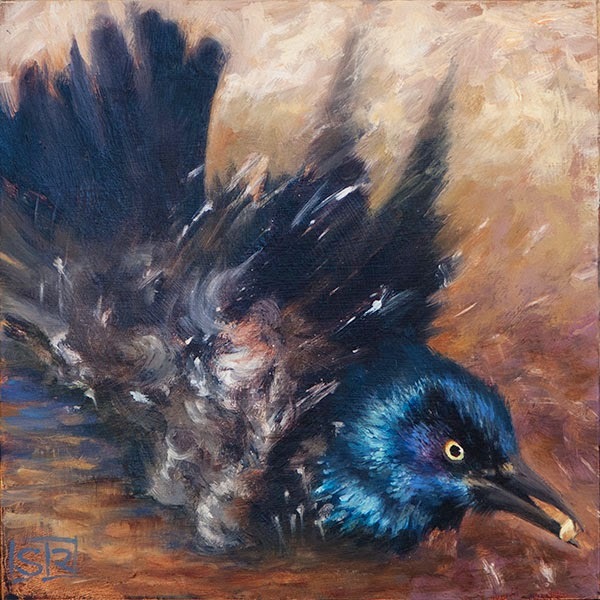 I am pleased to be one of the guest artists included in the juried exhibition that will line the halls of the studios. 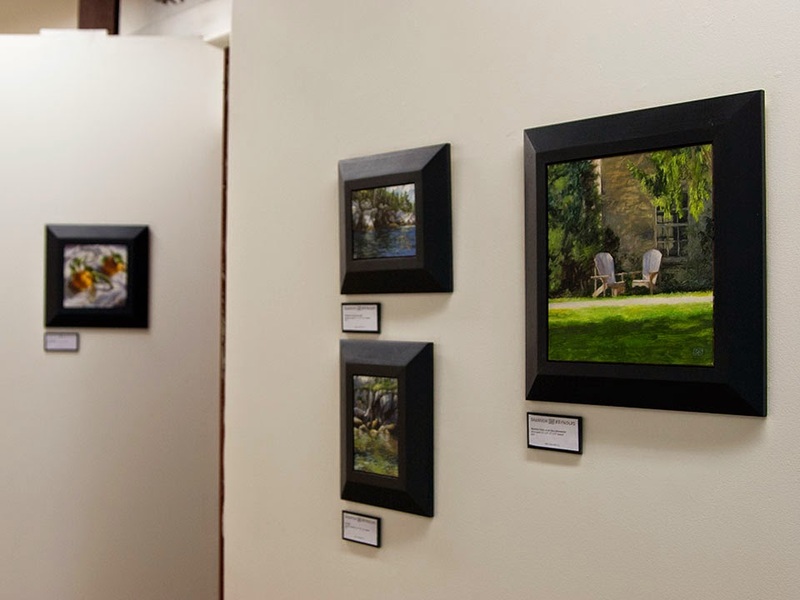 All of the participating artists will be present for the duration of the show. If you're in town this weekend, I hope you'll come by and say hello. 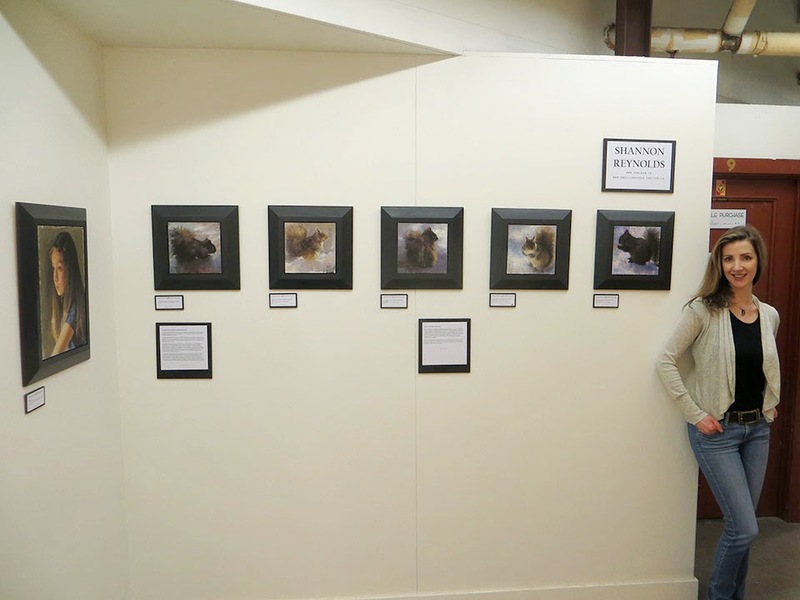 My thanks to Michelle Purchase, whose studio my work is hanging just outside. Michelle has an exhibition of 40 or so of her beautiful prints hanging at the Red Brick Cafe in Guelph until this Sunday and as a result of having so few pieces left to show, Michelle generously donated her wall space to me, giving me a little extra real estate and allowing me to hang fifteen paintings. 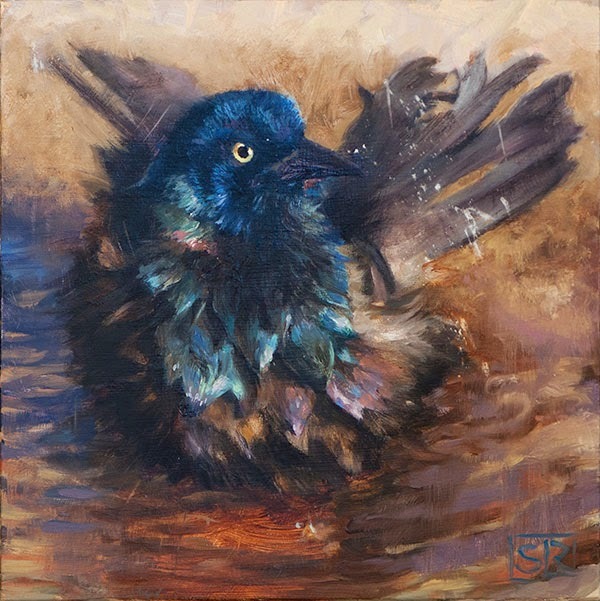 Splash #1 Common Grackle, oil on panel 8" x 8"
Sleek handsome and suave one moment, outrageous posturing goofballs the next: the grackles have returned. I've missed their strutting, sky pointing, and puffing up to the point of exploding before releasing discordant squawks. We have a peanut mix in the bird feeder right now and when a grackle picks one out, it parades around with its prize, dropping it and picking it up, washing it in the birdbath, in a sustained effort to break it into smaller pieces. 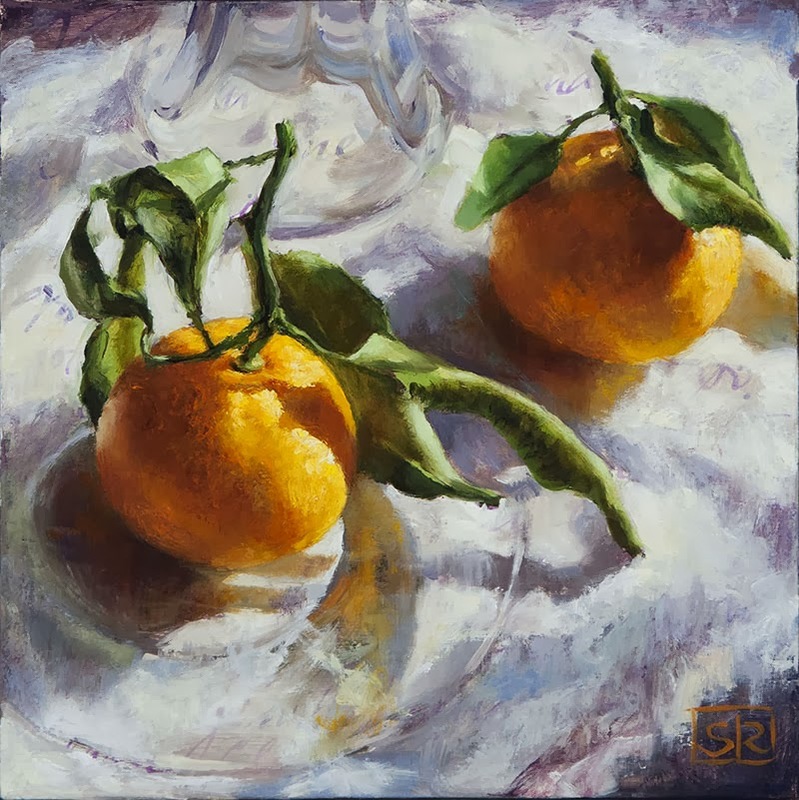 I'll be showing these two paintings among others at the Globe Studio's Spring Open House and Art show this Friday and Saturday where I'll be one of several guest artists exhibiting work alongside the resident studio artists. Click here for more information about the show. The ultimate harbinger of spring. Lethal foe of grubs and earthworms. 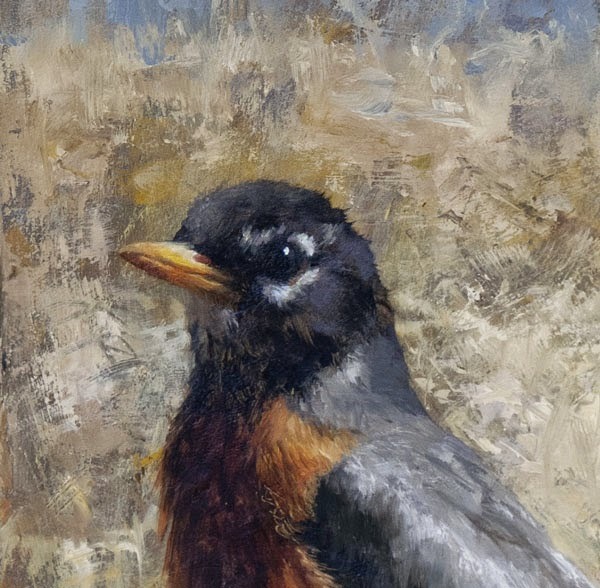 Spring Hunter: American Robin, oil on panel, 9" x 12"
I'll be showing this painting among others at the Globe Studios Art Show and Open House where I'll be participating as a guest artist this May 9th and 10th. 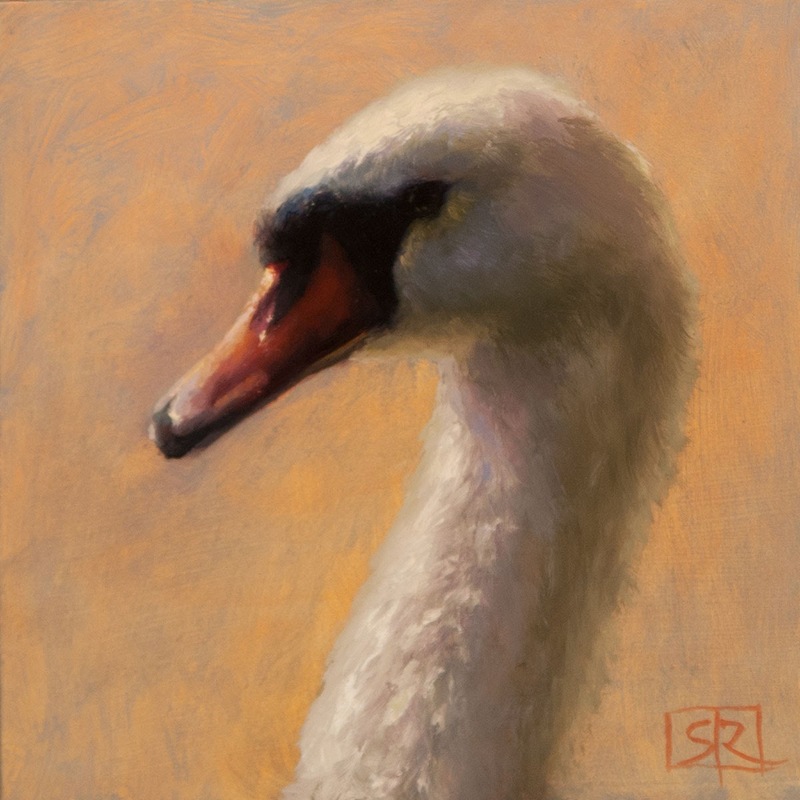 Please visit the studio facebook page here for more information. 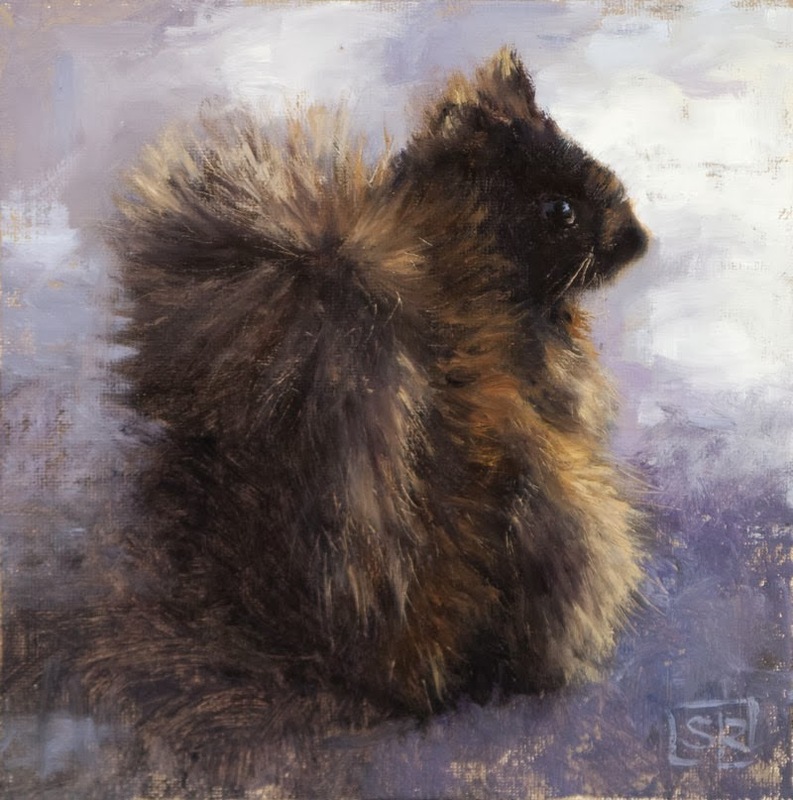 Local character study #3: Black Squirrel looks over shoulder, oil on canvas board, 8" x 8"
We've sprung forward and I'm extremely grateful to have the one hour extension to my painting day. The sap must be running because the rabbits have begun girdling my small trees and I'm almost ready to wage war. 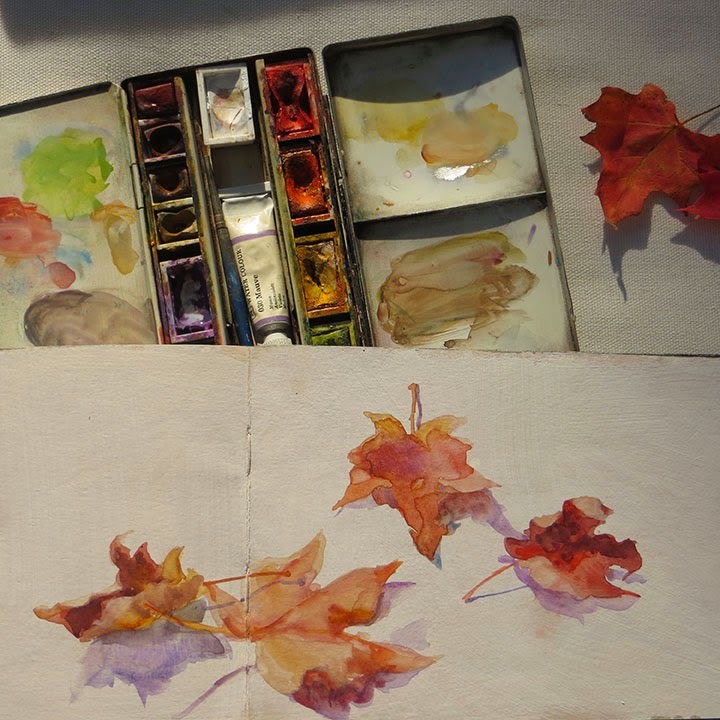 But the squirrels as yet have no tulips to mangle, so I'm painting them as though they won't soon be my mortal enemies. Another study from the local cast of hardy characters on the other side of the glass. 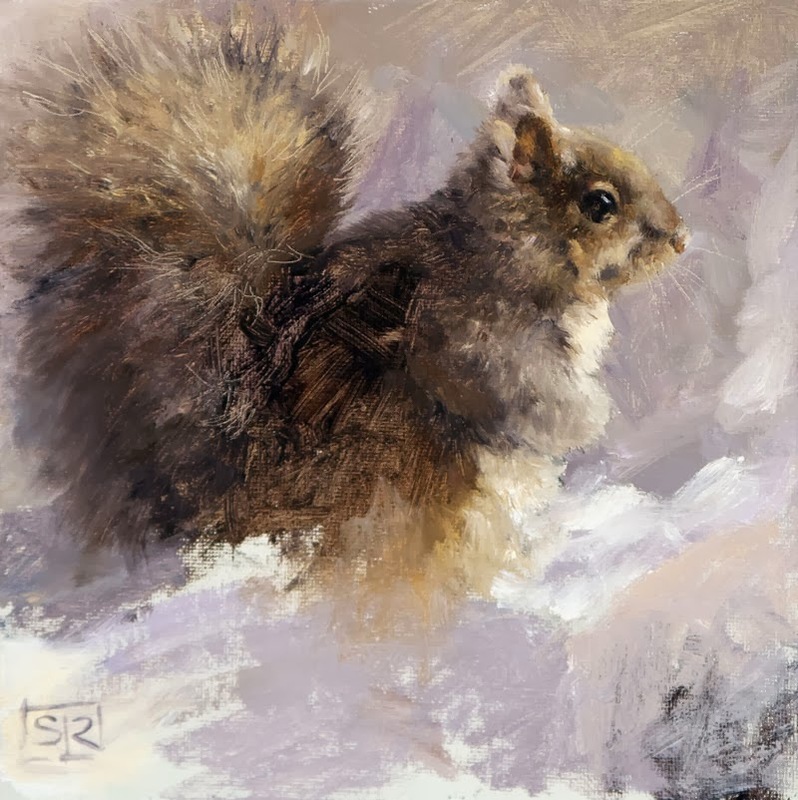 Local character study #2: Eastern Grey Squirrel in the Snow, oil on canvas board, 8" x 8"
This has been the longest, most shut-in winter I can remember. 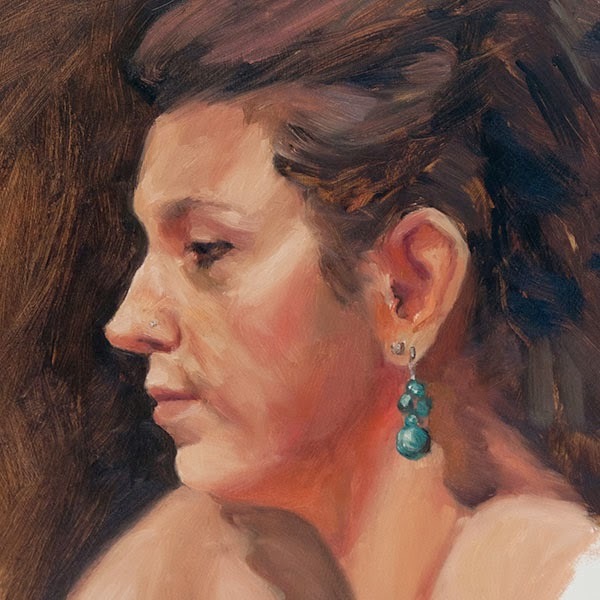 I've only made it out to life drawing a few times, but I've no shortage of models. I've been painting the local scene. 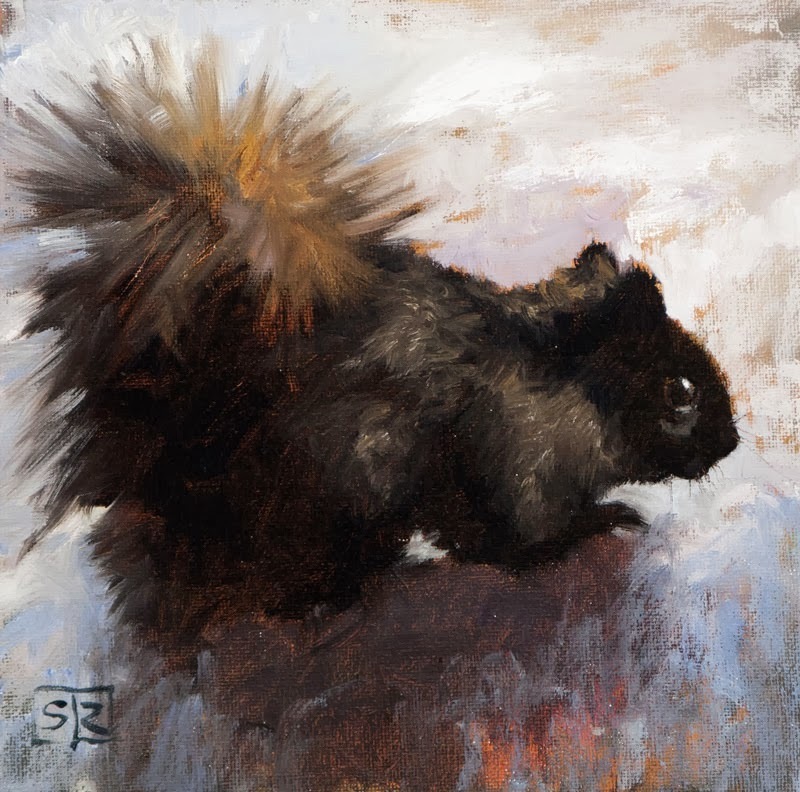 Local character study #1: Black squirrel crouching, oil on canvas board, 8"x8"
Some toughs have taken up residence around the bird feeder, and it's not who you might think. No hawks here, just doves. Dove toughs. They hang in the locust tree and whenever some smaller species lands near the feeder, they whir down and bully the little birds away with sheer size, and numbers, and that jerky, bobble-head, stink eye thing they do so well. 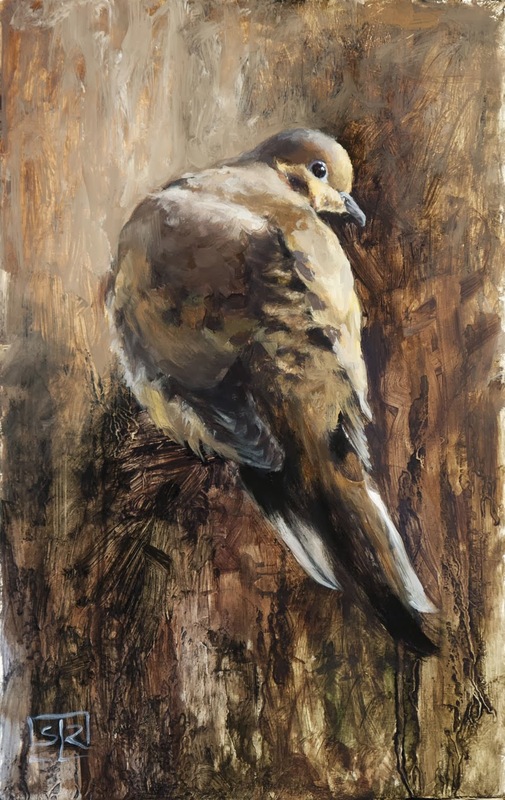 Mourning Dove, oil on panel, 7" x 12"
I've been taking advantage of the opportunity to paint from life at monthly three-hour single pose sessions at the Cambridge Centre for the Arts. 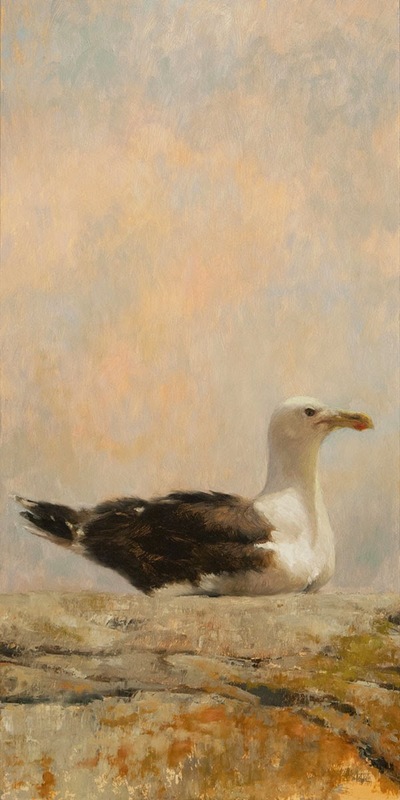 The brief single session forces concentrated observation and loose paint handling. 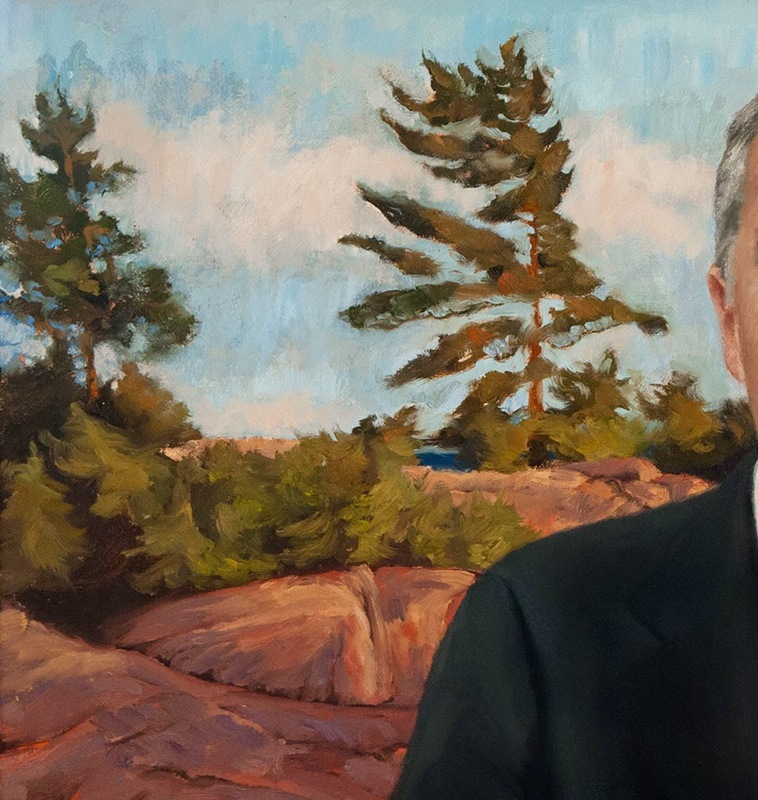 This one is from the January session. 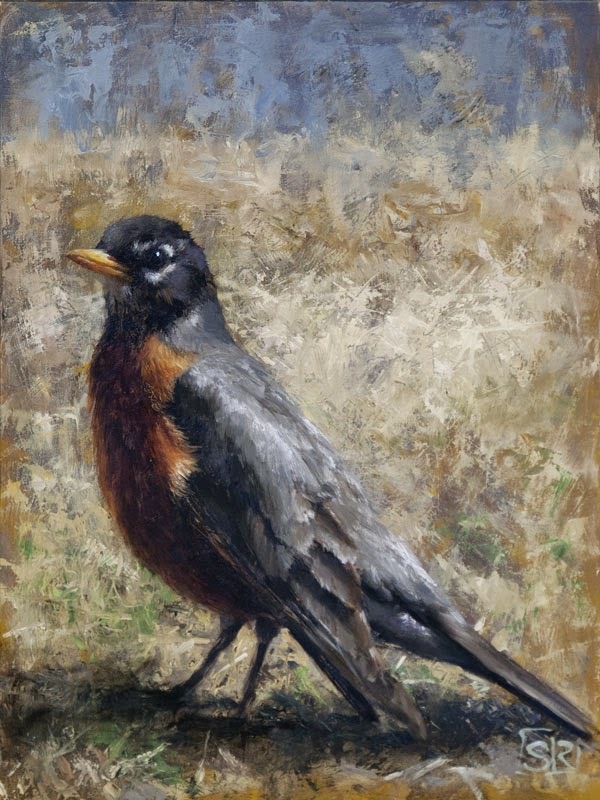 Robin, painted study, oil on prepared paper, 11" x 14"